When we talk about the most powerful smartphone processors or SoC Chipset, there are many top of the line smartphone SoC comes into mind and some of them are, Apple’s A11 Bionic, Huawei Kirin 970 and Qualcomm Snapdragon 835. All these latest chipsets come with advanced 10-nanometer design and it’s being used in latest Flagship devices such Apple’s iPhone 8, Huawei Mate 10, Google Pixel 2 and OnePlus 5. All these SoCs are best in class and provides phenomenal high-speed mobile performance by consuming less power and provides exceptionally long battery life compared to the earlier generations SoCs. These 10nm chips provide lightning-fast streaming of video and audio and data transfer speed up to 1Gbps download and 150Mbps upload speeds. But, is there anything which makes them stand out from each other? 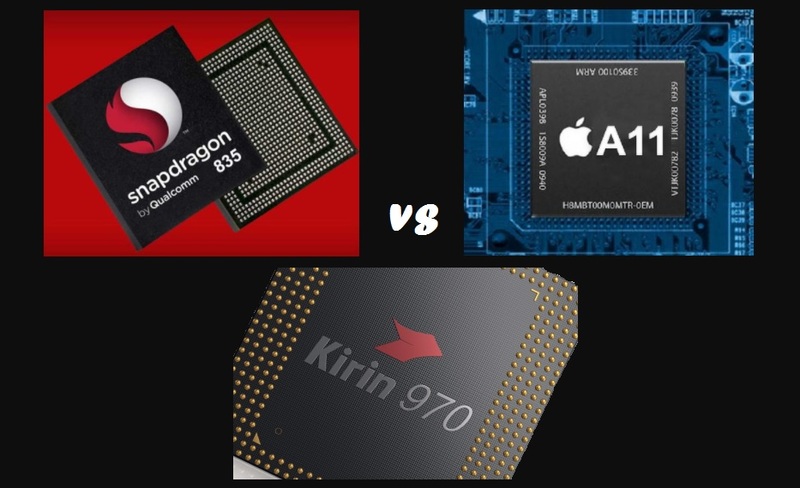 To find out this I will compare here Apple A11 Bionic vs Huawei Kirin 970 vs Snapdragon 835 and we will see how they differ from each other and will find out the best SoC. Apple recently launched its most powerful iPhones ever the iPhone 8, iPhone 8 Plus, and the beast iPhone X. All these new iPhone devices packs Apple’s new A11 chipset called as ‘Bionic’ in other words these devices packs a 10nm 6 x Cores (hexa-core) processor chip clocked at up to 2.74 GHz which ensures the maximum power and efficiency to the device. Apple claims that the new A11 Bionic chip provides 25% faster speeds on the two performance cores, and 70% faster performance from the four remaining efficiency cores. Moreover, there’s a performance controller, that apparently provides 70% faster at handling multithreaded applications. The performance Controller also helps in optimising battery life, by shutting off cores when not in use. Now talking about the GPU. The Apple-designed 3-core GPU ensure 30 percent better graphics rendering than the A10 chip. The new A11 chip also includes new ISP (Image Signal Processor) which process pixels better and allow faster low-light autofocus. Huawei unveiled their latest and most powerful Kirin 970 chipset last month which is now powring Huawei’s latest flagship Mate 10 smartphone. 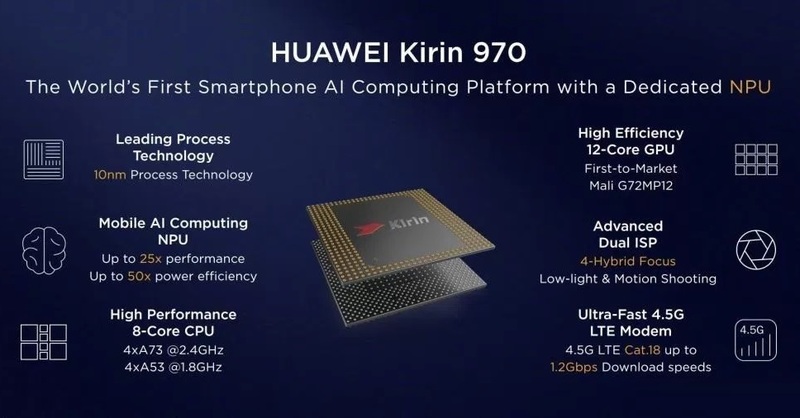 According to the company, Kirin 970 will be the first smartphone chip featuring a Neural Processing Engine (NPU), basically, a piece of hardware that would be great for Artifical intelligence and Augmented Reality for smartphones. Huawei CEO Richard Yu has made claims that their latest SoC that has been built using 10nm fabrication process with a 12-core GPU is better than the processors powering Apple and Samsung devices. Kirin 970 is a 10nm octa-core processor chip, with a 12-core GPU, dual-ISP and a high-speed Cat 18 LTE modem. It is clocked at 2.4 GHz and 1.8 GHz respectively. The Kirin 970 is also the first commercial SoC to use the Mali-G72, the latest GPU from ARM. 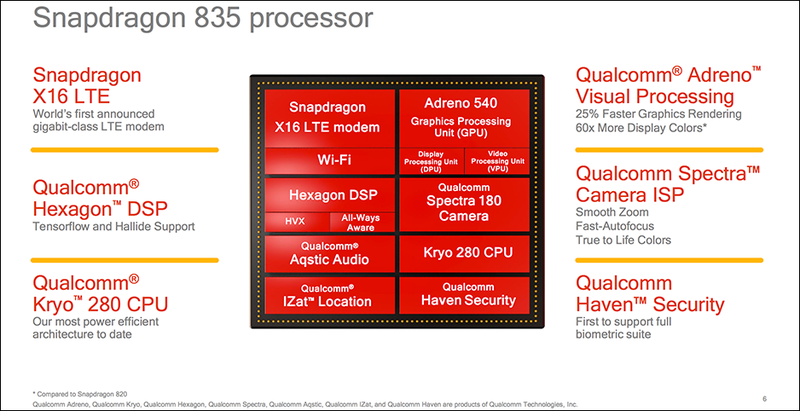 Qualcomm’s Snapdragon 835 SoC has been there since so long for powering so many Android smartphones and of course, it has been one of the best popular SoC too for many Android smartphones. Some of the recently launched flagship devices like Google Pixel 2 and OnePlus 5 also packs Snapdragon 835 SoC. The Snapdragon 835 is made with 10nm chip featuring 8-Cores based on 64-bit CPU architecture clocked at up to 2.45 GHz that ensure a seamlessly powerful processing speed to your smartphone for multitasking and gaming performance. It is 35% smaller and uses 25% less power than previous designs, and is engineered to deliver exceptionally long battery life, lifelike VR and AR experiences. Snapdragon 835 SoC packs X16 LTE modem that delivers peak download speeds up to 1GB per second. That’s 10X as fast as first-generation 4G LTE. For the camera performance, its 14-bit Qualcomm Spectra 180 ISP supports capture of up to 32 megapixels with zero shutter lag. The Snapdragon 835 also features a powerful Adreno 540 GPU that delivers up to 25% faster graphics rendering and 60x more display colors compared to previous designs. Now you know about all these three latest SoCs. All these 10nm SoCs are best in class and provides outstanding performance whether its multitasking, web browsing, gaming and capturing photos with the camera of your smartphone. With these SoCs, you can easily record or capture your life’s beautiful moments in 4K Ultra HD Videos @ 30FPS and you can play videos at up to 4K Ultra HD @ 60FPS. Its 64-bit operating system allows smartphones to have more than 4GB of RAM that opens new performance possibilities. However, you can’t just buy or like any of these SoCs unless you decide that which smartphone platform you like the most such as Android or iOS, you can easily choose between Huawei Kirin 970 and Snapdragon 835 because these two comes with the same OS platform that’s Android. But if you want to go with A11 chipset then you will have to choose the iOS platform which you can get by purchasing recently launched iPhone 8 or iPhone X which comes with Apple’s new A11 chips. So, to use any of these SoCs first you will need to decide which platform you choose Android or iOS. Moreover, If you go with Android platform then you have several options to choose for your SoC, for example, you can choose between, Huawei Kirin 970, Qualcomm Snapdragon 835, MediaTek HelioX30 and Samsung Exynos 8895 and all these SoCs are made with 10nm chips and come with Android platform. Which smartphone SoC you like the most? let me know in the comments section down below.